F(l)avorite Things are posts where we talk about, well, our favorite, flavorful things. Here, Kate talks about how she indulges in a post-work treat. I work on Sundays. When I am absolutely certain everyone else is off watching movies, frolicking in the park, having one last weekend beer, or whatever it is that I happen to wish I were doing at that moment, I am prepping to teach a yoga class. And then I go teach said yoga class. And while I always enjoy it once I’m there, and leave feeling happy and centered and all that, I never really want to go. It’s not just that I’m lazy (although that’s part of it), it’s that there’s something so irksome to me about working on a day that everyone else has off. So sometimes (read: every week), I need a little treat to get me through it. “Just plan this class, teach the class well, and after it’s over you can stop by ‘SNice, and get a little takeout,” I tell myself soothingly. A light at the end of the tunnel. That light is the Roasted Vegetable Panini from ‘Snice brooklyn. 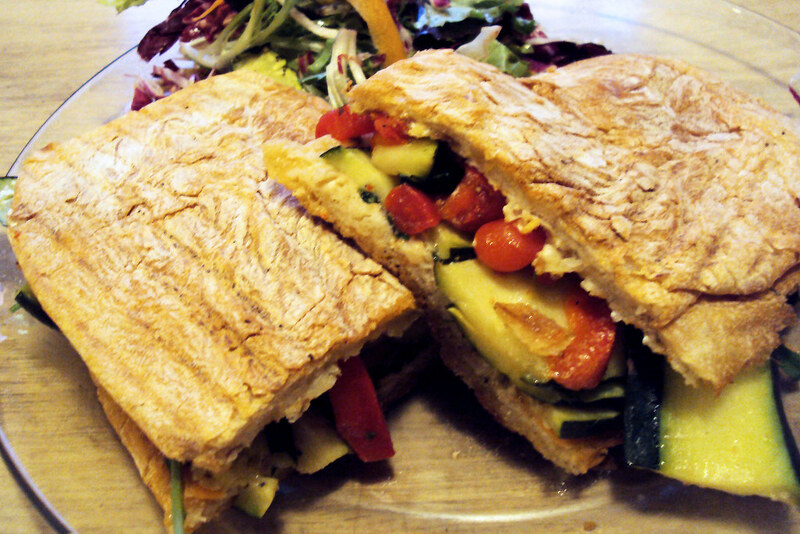 The Roasted Vegetable Panini is what it sounds like yet somehow unlike any other veggie sandwich I’ve ever had. A generous amount of roasted thinly cut strips of green and yellow zucchini and roasted red peppers nestled in between goat cheese-spread, and arugula-adorned ciabatta bread from Tom Cat Bakery. The veggies are always warm and flavorful, the goat cheese is a nice creamy component, but really this sandwich is all about the bread. Delicious, hearty, chewy, warm ciabatta often torn off in hunks and eaten on its own. Often I sprinkle course sea salt on each individual vegetable before I spear it with a fork. Or eat it open-faced with little drizzle of sriracha. It’s messy. It’s fun. It’s satisfying. 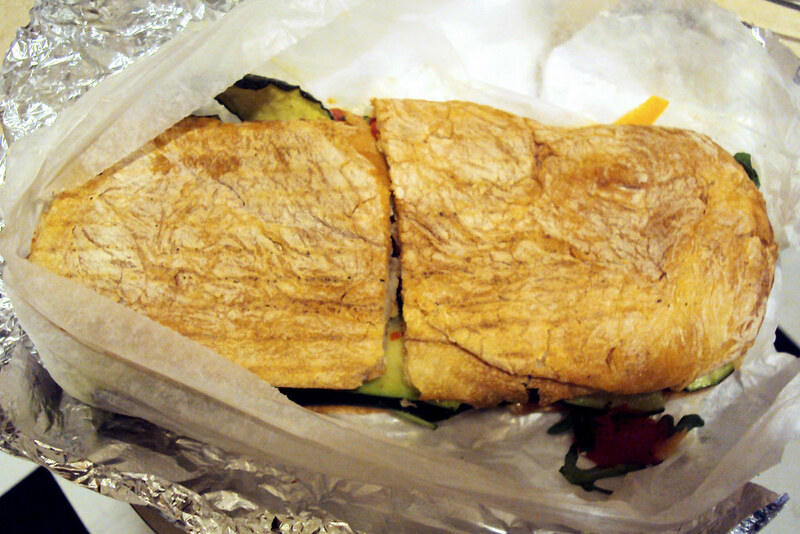 The panini, cut in half. Did I mention that I usually eat this sandwich alone? There’s also a light at the end of my panini tunnel. If I didn’t have yet another light, I would be too very sad once I finish the last lovely bite of my sandwich. The Carrot Cake Cupcake helps me deal with that loss. 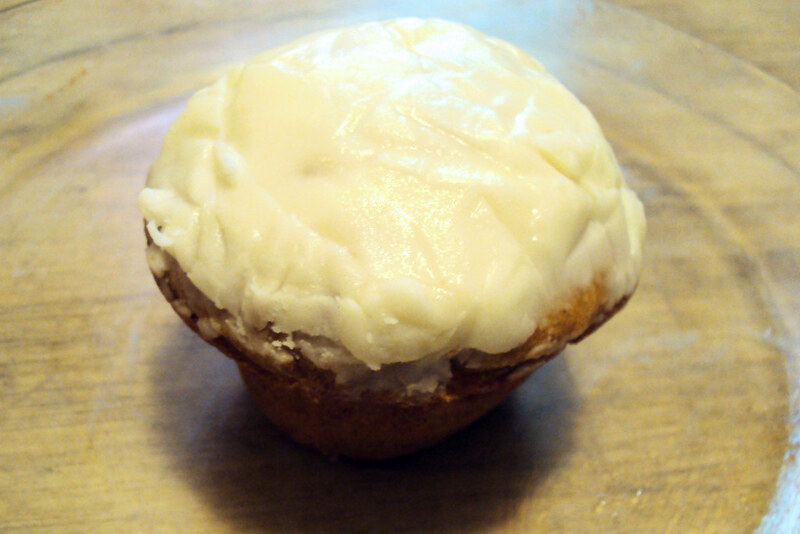 The Carrot Cake cupcake is amusingly titled the “Carrot Cake Muffin” by those tricksters at ‘Snice. Perhaps they think that if you make a moist, carroty cake, then slather it with an inch of sweet and rich (but not too sweet, and not too rich) frosting, and call it a muffin, then people will feel better about eating it. It’s a cupcake, my friends. And a good one. The cupcake, cut in half. I usually cut it in half and consider putting the other half away for later. Then I eat it with a fork as I would a piece of cake and plow delightedly through the entire thing. There is no other way. 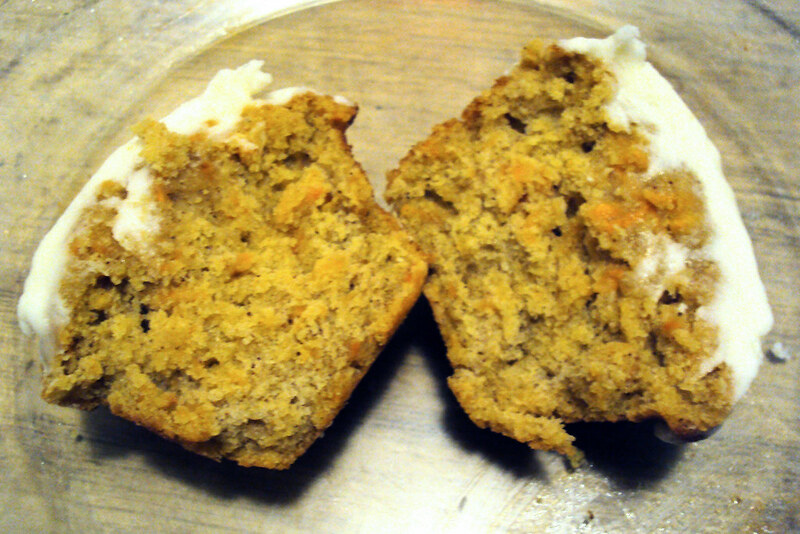 carrot cake “mufffin” all I can say is……”oh my”. Thanks for another entertaining & informative entry. See ya.